This is a remarkably original and impressive project. It not only exposes a detailed quasi-scientific approach to the art of dance, but it also emphasizes the benefits of data visualization in the understanding of a fundamental form of human expression. 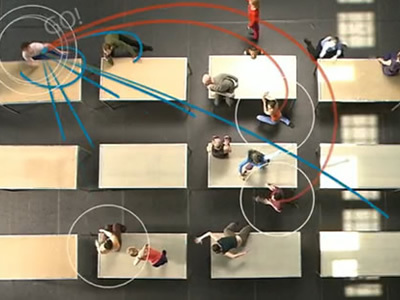 A joint project of choreographer William Forsythe and Ohio State University's Advanced Computing Center for the Arts and Design (ACCAD) and the Department of Dance, Synchronous Objects is an extensive and unique resource. 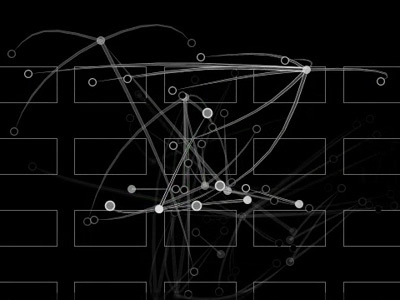 This project aims to create a large set of data visualization tools for understanding and analyzing the interlocking systems of organization in the choreography of William Forsythe's "One Flat Thing, reproduced" (2000). These systems were quantified through the collection of data and transformed into a series of objects - synchronous objects - that work in harmony to explore those choreographic structures, reveal their patterns, and re-imagine what else they might look like. As the authors explain: "Our goal in creating these objects is to engage a broad public, explore cross-disciplinary research, and spur creative discovery for specialists and non-specialists alike." The images shown here are from a section called Cue Annotations, aiming at visualizing how dancers give and receive visual cues to and from each other. A cue is an indication that one or more dancers can initiative a specified movement phrase. You can watch an explanatory video or watch four annotated videos (with dancers and annotations). There is a lot to digest on the site, and in the beginning, the amount of (great) content can be a bit overwhelming. But it's certainly worth every minute. You can see a video about the project, featuring interviews with the authors, and the project's photo gallery.